The rot in the wood of the Flagship Niagara looks exactly like what you'd see in a fallen log on a walk in Asbury Woods. The wood is soft and powdery and crumbles easily when you flake it with something hard, like a marlinspike, that short length of steel used by sailors for routine tasks aboard a tall ship: for splicing rope, say, or as leverage while seizing two lines together. Or for chipping away rot in wood. The rot in the Niagara that caused it recently to dry-dock in Cleveland wasn't as visible as you'd think from the recent headlines about its repairs. If you stood in the tentlike structure on the float tethered to the port bow (for protection from the elements for the shipwright, and dubbed "Occupy Niagara" by the crew) and saw the stripped away planking and the bare frames, you would see only thumb-sized tunnels of rot in the timbers. The problem, of course, is that rot weakens the integrity of wood, and the wood in question comprises the frames -- the very ribs of the ship that extend upward from the keel and forming its skeletal structure. And rot spreads. That's because rot is actually colonies of microscopic fungi secreting digestive juices onto its host -- the Niagara's frames -- breaking down the wood's cellulose into (for a fungus) a delectable stew. It eats and reproduces, sending its spores deep into the wood. To do that, rot relies on three ingredients: oxygen, energy (from its food -- the Niagara), and water. And it's for that reason that rot is normal aboard wooden ships, as is regular maintenance to replace wood infected with rot. And so it was in this case. According to Wesley Heersson, the Captain of the Niagara, when the ship was in dry dock last fall for scheduled maintenance, a small pocket of rot was discovered in the planking on the bulwark around the port bow's hawsehole -- the round hold in the side of the ship through which the ship's mooring cables are passed when docked. The planking would have to be replaced -- and there was a risk "that rot may have spread to [or originated] from the framing beneath the planking," wrote Heersson in an email. Maintenance to repair the rot was scheduled for this winter. Because the wood in the area of the rot had been replaced already in 1997, there was no suspicion that it would extend to below the waterline. But when the planks were removed in January, rot was evident in the frames. "The rot...was found to have traveled downward over the years," wrote Heerson, "spreading like a cancer and infecting the entire length of the affected frames. This requires that the frames be replaced entirely, which requires exterior hull planking to be removed below the waterline." 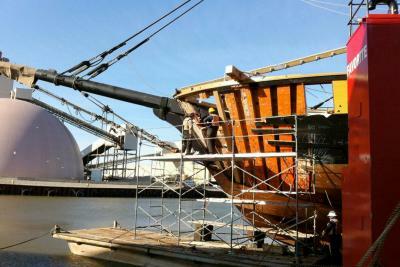 And to make these repairs, the Niagara needed to go to dry dock. In his office on a wet, blowy February afternoon, Captain Heersson -- wearing work pants and a wool cap -- shows me blueprints of the Niagara on his computer. Outside, the crew scrambles about the ship in bright orange survival suits loading the equipment necessary for the Niagara's cruise to Cleveland. Heersson launches on a long disquisition about the construction of a hull of a tall ship. I don't really follow: it's long and complicated and full of unfamiliar words, like "knighthead" and "futtock," but I do get the fact that, in order to get at the rot, a lot of wood needs to be removed and replaced. "The rot in these frames began twenty years ago," says Heersson, "during the ship's construction in 1988." At that time, the rails were capped with yellow pine, which degraded quickly in the sunlight, shrinking and developing "checks" -- cracks the run along the grain in the wood -- and which allowed water to seep into the bulwarks and the frames below. The yellow pine was replaced in 1992 with kiln-dried, pressure-treated wood to prevent further leakage, but it's likely the water that seeped through the original rail caps started the process of rot. Despite maintenance done to the area -- planks were replaced in 1992 and 1997 -- the rot spread out of sight in the heart of the wood hidden beneath the deck and bulwark. "Rot in a ship's internal framing is likened to bone cancer," wrote Heerson in his earlier email, "it cannot be seen with the naked eye." "It is a blessing in disguise that we did not open up this project in the last dry dock," said Heerson in his office. "We didn't have all the oak we needed to replace the beams -- it's very expensive -- we didn't have all the douglas fir in place for some of the upper planking. We needed to order the supplies to get the job done. just to sit there, planning out how to deal with this issue." In contrast, finding the rot this winter allowed the shipwright and carpenters time to prepare the supplies and set up for work in the weeks before the scheduled dry dock, minimizing the time spent. Still, dry docking does cost money, money that originally hadn't been budgeted for this winter. "We're diverting other monies that were allocated for the maintenance and repair budget for the entire year," said Cal Pifer, the Flagship Niagara League director of marketing and development, explaining why no special fundraising effort needs to take place to cover this winter's costs. "We do have cash on hand." But that deferred money means other initiatives -- like the sail replacement project -- have been deferred. What about the long-term viability of the ship? "The basic story here is that the Niagara's hull, which was built in 1988," said Heersson, "means it's now 25 years old. When a wooden vessel is between 25 and 30 years old, it starts showing signs it needs a new deck or a new hull, or major structural repairs." Heerson stressed that the Niagara and the League need to start stockpiling supplies -- especially lumber, which, besides being expensive, is cut "fresh from a forest in Canada," milled to order in Seattle,and kiln-dried for 3 weeks. "Or they have to set it out in the yard for years to let it air dry," said Heerson, "which is the preferred method." In short, to avoid delays at future dry docks if any unexpected maintenance crops up -- not improbable, given the ship's age -- the Niagara can't afford to wait for its lumber. Beyond that, Heersson said there's a need for a strategy for a major refit in the next 5 to 10 years. "Wooden ships will surprise you," he quipped. "Is it feasible to maintain a ship like this?" he continued, choosing his words carefully. "The answer to that is clearly, 'yes.' But it requires planning. It requires a commitment that you do intend to keep the ship for a long period of time." Pifer would agree, and lays that commitment onto our shoulders. "This project is a reminder to the Erie community as to how important their individual memberships are," he said, "in order to keep the Flagship Niagara here and sailing." Pifer also stressed the Niagara's uniqueness. "There is not another ship like the Niagara in the United States," he said. 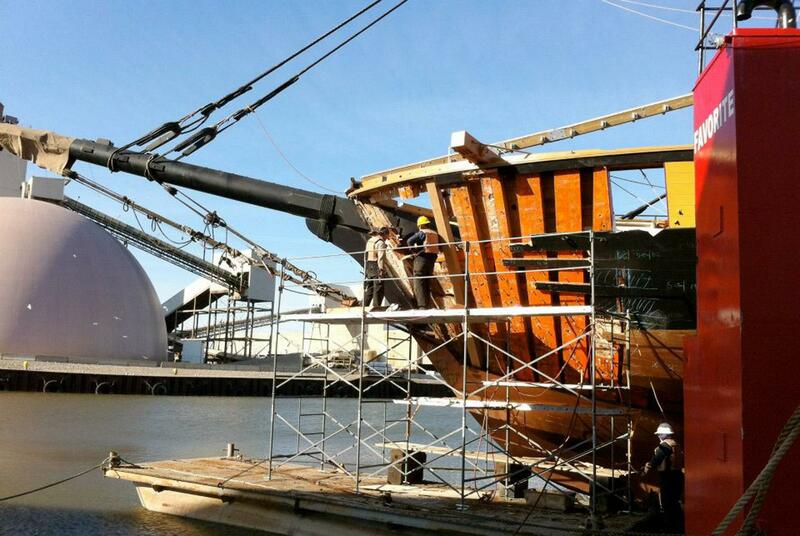 Meanwhile, in Cleveland, the Niagara is back in the water. The repairs are done. According to Heersson, workers found "exactly what was expected." No new rot was found. And the infected frames have been replaced. On April 3, the ship is expected to cruise back to Erie, where the planking above the waterline will be replaced, and the usual preparations to ready the ship for the summer sailing season will be made. That means, by the time you hold this paper in your hands the Niagara should be home, where it belongs.